Consumers of large amounts of calories who want to keep their weight under control may benefit from Grape Seed Extract. Dutch researchers at the University of Maastricht published an article on the subject eight years ago in the European Journal of Clinical Nutrition. 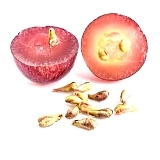 Grape Seed Extract is an interesting supplement. It improves blood circulation; animal studies have shown that it reduces the chance of prostate cancer, and epidemiological studies have shown that it reduces the chance of skin cancer. In-vitro studies have shown that it sabotages the conversion of testosterone into estradiol by the enzyme aromatase. In test tube studies Grape Seed Extract also stimulates lipolysis: the release of fatty acids by fat cells into the bloodstream. [Int J Obes Relat Metab Disord. 2000 Mar; 24(3): 319-24.] This may mean that Grape Seed Extract suppresses the appetite, and to find out whether this is the case the Dutch researchers did an experiment with 51 test subjects aged from 18-65. The researchers let their test subjects eat as much as they wanted during a three-day stay in a laboratory. About 30-60 minutes before their breakfast, lunch and dinner the subjects took a supplement containing 100 mg Grape Seed Extract. A couple of weeks later the researchers repeated the experiment, but gave their subjects a placebo. The effect of supplementation was related to the caloric intake of the subjects. If calorie intake was lower than average then Grape Seed Extract had no effect on the energy intake, as shown in the table below. The 'small eaters' consumed an average of 1500 kcal per day. In the subjects with an above-average energy consumption Grape Seed Extract did reduce energy intake, as shown in the table below. The average energy intake of this group was 2030 kcal per day. Among the 'big eaters' the Grape Seed Extract supplement reduced their energy intake by 96 kcal per day. If that effect were to last for a whole year, then people with high caloric requirements could lose 3.7 kg body fat in that amount of time. Eur J Clin Nutr. 2004 Apr;58(4):667-73. Does Grape Seed Extract protect your heart and blood vessels when you're on steroids? You consume too many calories, and therefore you are fat and out of shape. The best medicine? More exercise, most scientists will say. A solid advice, but it will be even more effective if you also supplement with grape extract. Conclusions drawn by Japanese researchers in a human study. Sponsor alert.